This cheap Osmo Pocket tripod adapter accommodates the wireless adapter. 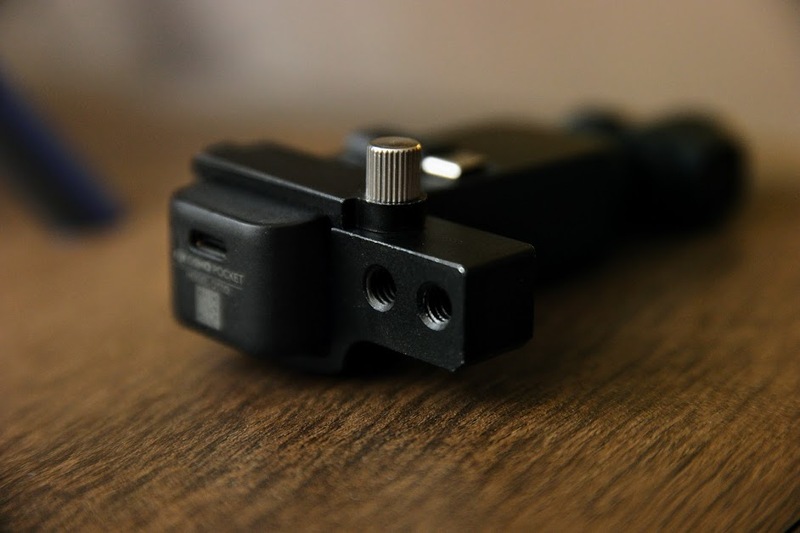 This is a review of a generic tripod adapter for the Osmo Pocket, with an unusual off-center design that makes it compatible with the Osmo Pocket wireless adapter. The Osmo Pocket has no built-in tripod hole. Instead, to add a tripod hole, you need to purchase the extension handle (selfie stick). This problem has invited third parties to provide solutions. One of the earliest third party tripod adapters is this tripod adapter with four tripod holes, offset from the center. 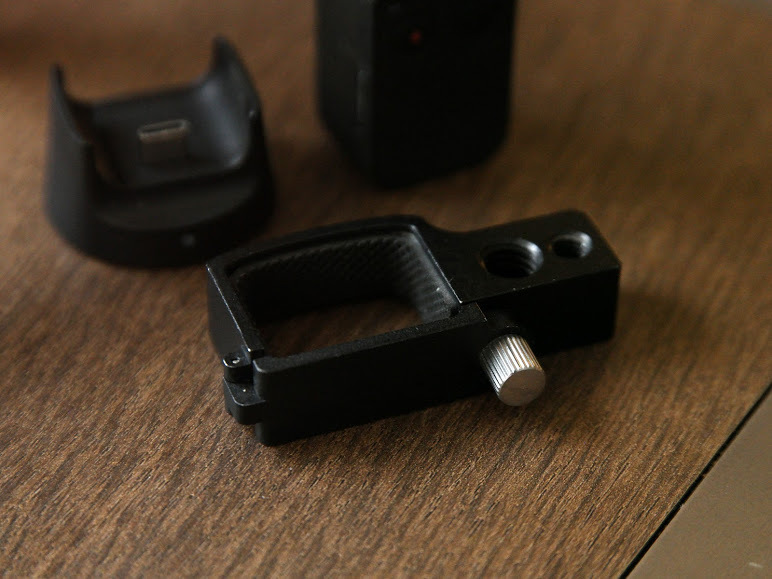 This tripod adapter is made of metal, and has a rubber padding for friction. 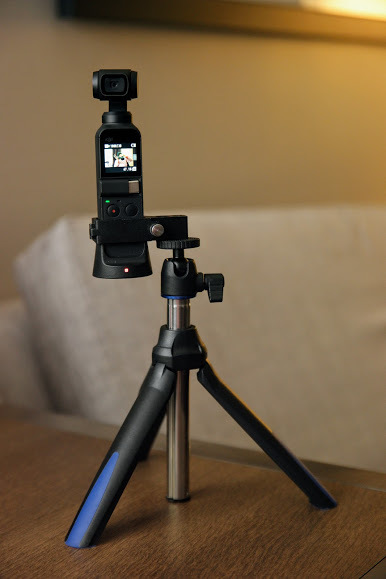 The offset design keeps the Osmo Pocket’s base accessible, thus allowing the use of the Osmo Pocket wireless adapter with this tripod adapter, unlike other tripod adapter designs. This tripod adapter is unusual in that it has four tripod holes. Three of the holes are 1/4-20 and the remaining hole is a 3/8-inch hole. I surmise that the holes farther from the body are to make space for the wireless adapter, while the ones closer to the body provide holes that are a bit closer to the center when the wireless adapter isn’t being used. The tripod adapter seems to be designed for selfie sticks and monopods, although it is possible to mount it onto a quick release plate or bracket if the tripod hole were placed in the lowest possible position (although this would preclude the use of the wireless adapter). The adapter has a ‘door’ that swings out, but I found that it wasn’t necessary to open it to install the adapter. Instead, I could just loosen the knob on the door, and it would be enough to allow the adapter to slip onto the Osmo Pocket. At the same time, due to the knob and the rubber padding, the adapter could hold the Osmo Pocket very securely. I’ve now used this type of tripod adapter in a variety of situations. It is reasonably easy to attach it and remove it. I was initially put off by the offset design, but now that I have a wireless adapter, I find this tripod adapter more useful than the other tripod adapter I have. I only wish there was a way to protect the gimbal (since the included case won’t be able to fit when you’re using this or any other tripod adapter. This tripod adapter is sold under many brands and is available online from a variety of sources including Amazon (around $10). I recommend using this with a selfie stick that can be angled, such as the Benro MK10 (when used with its ballhead), as shown in the photos above. hey mic ty, i just received accessories from polarpro for the osmo pocket. they are amazing!!! aaa+++ quality. i purchased the 1/4 20 mount, filters, and case. definitely worth the $. do you want me to send pics and review, or is this on your radar for you to review? also fyi… put the osmo pocket on top of your dslr to shoot photos and videos simultaneously!!!! This mount has worked well for our Osmo Pocket distance tests with the wireless module. Leaving the wireless module unobstructed, especially by metal under its base, allows the radio signals to radiate properly. Polarpro make two; one for use without the wireless module, and one with. The mount for the wireless module is made of polymers, so it shouldn’t interrupt the radio signals. Also, a company called Taipan Cinema have made an aluminium exo-skeleton for the Pocket that can be used with or without the wireless module. Its coming soon, 15th March 2019 or soon after last we heard. They say they’ve left the sides of the wireless module expose, to prevent loss or attenuation in radio signals. Great website, and source for 360 gear by the way. Thanks Tom! Yes i’m also looking forward to the Taipan and Polarpro cages for the Osmo Pocket!